Look in your cPanel account under 'Databases' to find the 'MySQL Databases' image. Click that image to access your databases. Under Create a New Database, create a database name, eight characters or less. Your cPanel user name will be the database prefix. (e.g. if your cPanel user name is mysite, and you enter catalog, your database name will be mysite_catalog. Make a note of the database name. Go back, and under Add a New User, create a database user name, seven characters or less. As with the database, your cPanel user name will be the database user name prefix. Add a password; we recommend using the password generator to create a stronger password. We also recommend to use password length of at least 18 characters. Make a note of the database user name and password. Select the database user you created in step 3, and the database you created in step 2, then click Add to associate the database user with the database. 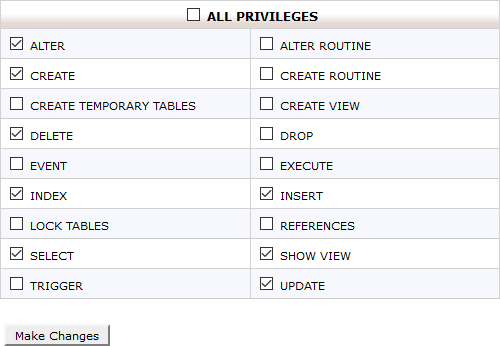 When asked to set privileges, select ALTER, CREATE, DELETE, INDEX, SELECT, INSERT, SHOW VIEW, and UPDATE. At this point, your database is ready to go! It will be empty. That is, it will not have any database tables or data in it. The slscart setup file will create those tables for you.